Scroll to the bottom to find links to past blogs. These open as PDF files. It takes a lot of observation and a good deal of training to begin to “think” like a river. And rivers don’t even think in any humanly ordinary sense, because they don’t have a central nervous system. But the responsiveness to change and the complexity of happenings in any stream could suggest that some mind is behind what they do. I leave that to theologians to consider. We – humans – “think like a river” by studying how they work and making their processes part of our thought processes. The river becomes us, perhaps. We will never understand the full complexity, simply because our sensory equipment (including the brains behind it) and all of our measurement devices cannot ever record everything that is happening. Still, ignorance is no excuse here, given the terrible condition of so many streams throughout the world, and the cohabitation of we humans with streams requires that we apply ourselves to the workings of geology and water flow in rivers. Photo:The Rio Grande ("Great River"; "Rio Grande River" means “river big river”) near White Rock, New Mexico, shows the S-curve patterns of familiar Midwestern streams. The river and its tributaries have shaped the valley and hills in the picture, over a very long period of time, by eroding downward and sideways through volcanic ash and lava (visible in the foreground). John Wesley Powell began by mounting an expedition to move down the Colorado River, with a photographer and scientists along. He took barometric readings of altitude, recording the height of the canyon walls and the drop in elevation of the water’s surface. Ann Zwinger started down the Green River from its headwaters in a canoe, but the river taught her that the craft simply wouldn’t work. Powell’s expedition worked with what it had and came out starving and weary and wiser about dryland rivers. Zwinger conducted her expedition in segments over several years and assembled them into a portrait that rafters have followed since. Luna Leopold (his father was Aldo Leopold) and his colleagues devised numerous methods to measure stream velocity, discharge, movement of soil and rocks, effects of flood peaks, and much more. They gave rise to the current studies of river geomorphology (the shapes or physical structures of different types of streams and valleys) and hydrology (how water flows in its channel and transports sediment). One point must be made clear at the outset: flowing water carries sediment. It must. It will. If it is denied the chance to do so (as happens in concrete and metal culverts or across bedrock or boulders), it seeks out the most available particles of clay, silt, sand, cobble, and even boulder to carry along with it. Human-created situations that cause water to lose its normal sediment load set up situations in which destructive erosion often occurs. The water “grabs” a large quantity of sediment as soon as it can, to restore its normal sediment-carrying function. Dams of all kinds and sizes famously cause sediment to drop on the upstream side, where the water slows, and sediment scour on the downstream end, where the water picks up speed and volume (velocity and discharge). Flash floods, especially those coming off pavement, roofs, and other impermeable surfaces, have too little sediment, so the water takes the necessary load from lawns, nearby stream banks, and even the stream bed. In the Midwest, the most familiar and visible streams are the permanently watered creeks and rivers. Often, they bend and twist through a flat river bottom of varying width. Through the principles of fluid dynamics (a branch of physics), water in these streams constantly make adjustments that involve how much water is moving at a given movement, the average amount of water of a period of decades or centuries, the sizes of particles that are available, the slope of the valley, and restraints such as underlying bedrock. The result is a meandering stream, full of bends or S-curves or meanders. There are other stream types in the Midwest. Some course down steep slopes and follow nearly straight courses, unless bedrock or other obstructions divert them or slow their speed. These lack the S-curves, and instead consist of natural dams or steps made of rocks, bedrock ledges, or large pieces of wood. These natural dams alternate with pools that temporarily hold and slow the flow. Close study of them shows that the slow parts of the pool collect sediment, while the fast parts below each step scour sediment away. Natural streams had dams and pools long before humans thought of manipulating rock and earth to fashion them into farm ponds and giant reservoirs. Photo above: The Gila River in western New Mexico, near the Gila Cliff Dwellings, flows deep brown with sediment and the ashes of a wildland fire. Recent rain has increased the speed and volume of the Gila here, so its sediment-moving capacity is increased. Much of the ash is dissolved in the water. Streams carry bothsediment and dissolved chemicals. Two examples of step-pool streams that run on steep slopes. 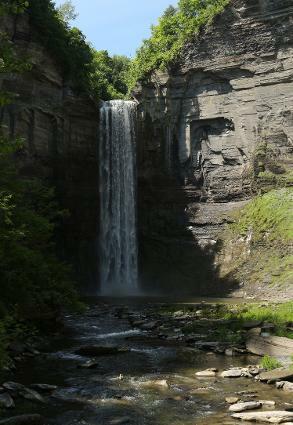 Left: The tallest step or waterfall at Taughannock Falls, above Cayuga Lake, Finger Lakes region, New York. The water's force has scoured out a pool at the base of the cliff, and in flood it has the power to move the large stone in the foreground. Right: A small, steep ravine waterway above Clanton Creek, Madison County, Iowa, where the stream has organized glacial cobbles into steps (short waterfalls) that rest above small pools with slightly less slope angle than the surrounding surface. The view is upstream or upslope. A young child plays in a small flow of water. The child scoops pebbles and sand to make a dam and cause the water to pool up. The water breaks through the dam because the sand is very saturated and very leaky, letting the water flow slowly through it and weakening it. Somewhere downstream a pair of beavers set about felling ash, boxelder, cottonwood, and willow saplings and trees to construct a dam that will also become their home and larder. They trim branches to lodge in the mud and form the walls and entrances of the dam. When colder whether comes, the beavers stock their larder with the green twigs and branches of their favorite foods, intending to remain for several weeks because ice has blocked their access to the surface. The child’s dam has short-term effects on water flow downstream. The beavers’ presence has longer consequences for the ecology of the pond behind it, and the dam may even cause a permanent wetland to form where one had never existed. Some students of the North American fur trade and the behavior of beavers consider them to have been the most influential animal on the ecology of most of the continent. Arguably so, as predators often are awarded this position in the food chains around us. Consider that the streams in Yellowstone Park began to function differently – more naturally – when gray wolves were reintroduced. The interactions of the wolves with their prey and the widening circle of effects on local ecology influenced stream function. Could such relationships have existed in Iowa? We don’t know. We could find out. Consider that bears in the Pacific Northwest were crucial to the ecosystem of streams in conifer forests because they caught salmon from the streams. The decaying salmon remains altered the soils near the river, which altered water clarity and chemistry and habitat. Again, the widening ecological effects through chemical, microbial, and plant processes. In the end, I have to ask myself, What is a river? It is a child, playing with a toy shovel and bucket. It is a beaver. It is the gray wolf. A river is a bear. It is you, and it is me. These answers are strange to me, because I like to assign categories and labels, and I like to think about objects as separate. Up to a point, that may be useful, but in inhibits an understanding of processes, interactions, and relationships. My world is in disarray now, because my categories don’t work as accurate descriptions anymore. Objects fade and processes appear. The river, the child, the beavers, the wolves, the salmon bones, and the bears become actions – verbs – in a world that suddenly looks very different, even though it hasn’t changed. Now I must pay attention to what is happening, and less so to the “things” that are there. I must slow down and spend more time looking closely. Banner photo by Curtis Lundy. All other photos on this page by Leland Searles.